Parts: ~ 40 Injection molded styrene (green, clear red and chromed) plus pre-wired LEDs and battery box. Instructions: Old-style assembly guide with (multi-lingual)text and diagrams. Accuracy: 8 - Round 2 have restored this edition of the kit ALMOST to original specs. Overall Rating: 8 - a blast from the past that makes for a fun weekend project. Back in 1968, AMT thought they could maybe cash in on the sci-fi craze and start a line of models not tied to a something for which they had to pay licensing fees. They hired Matt Jeffries - now the legendary designer of Star Trek's "no-bloody-A-B-C-C-or-D" Enterprise, but then jus the designer of Star Trek's USS Enterprise - to conceive what was hoped would be the first ship in a long and profitable line of model kits. Alas, it didn't work out and the "Strategic Space Command" died after just one kit. Frank Henriquez has the definitive story of this kit here. Round 2 has been giving new life to old models, and their latest effort is the Leif Erickson. They've made changes to the tooling since this kit was released in its "Interplanetary UFO Mystery Ship" guise IN 2009, trying to bring it back closer to its original configuration. 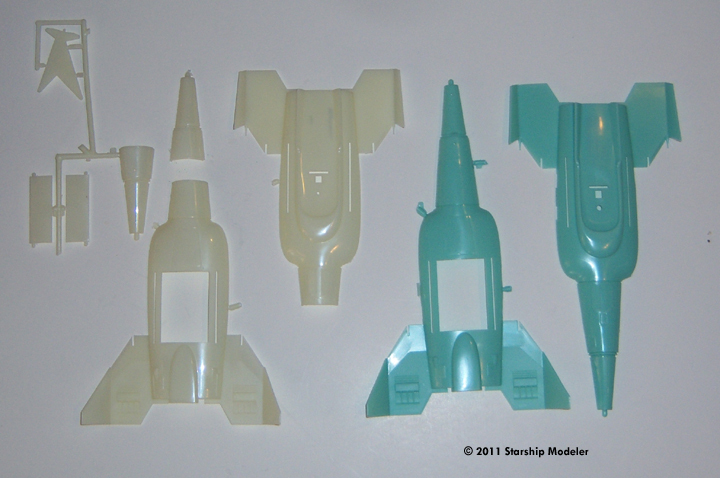 Over the years, the main hull mold had been altered and the clear parts mold had gone missing - as had the original box art. Inside the new "retro deluxe" box are 40 or so plastic parts (including a 2-part stand), a pre-wired strand of LED lights, a battery box, instructions in several languages and a large decal sheet. The plastic parts are packed in plastic bags to help prevent damage. Separate baggies hold the translucent red parts (engine bits), chromed parts (more engine bits, "phaser projector", "sensor ray dome" and shuttle's landing gear) and electronics. My sample was cleanly molded and had very little in the way of defects - just some minor mold seams. The chrome plating is not so heavy as to make those parts 'blobby', a plus. My kit had several different instruction sheets in various languages, including English, French, Spanish and Italian. Only the English version had the original SSC short story. Instructions are a mix of exploded assembly diagrams and text. They are straightforward - this is not a complex kit. 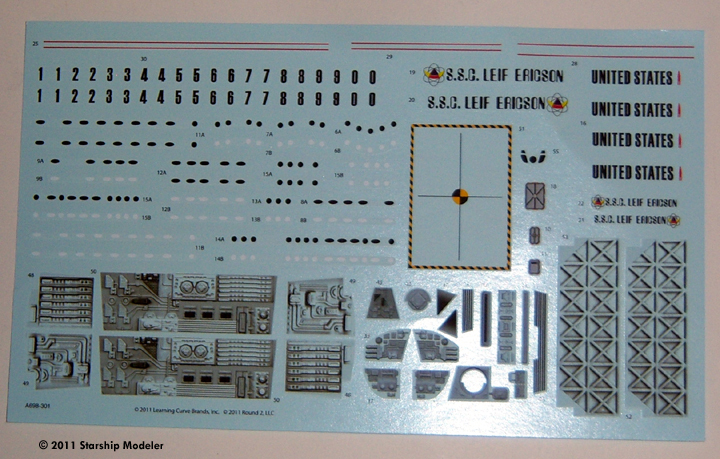 A large waterslide decal sheet contains markings for two ships (in different fonts): Leif Erickson and United States. Also included are a slew of windows, signage, and decals to cover the entire shuttle bay: deck, bulkheads and the inner surfaces of the bay doors. They are crisply printed, glossy and perfectly registered. It seems kind of silly to talk about "accuracy" of a one-off original design pulled from (mostly) original molds. Round 2 put forth some effort to address the detail differences between the original and last versions of the kit, though, so it's only fair. 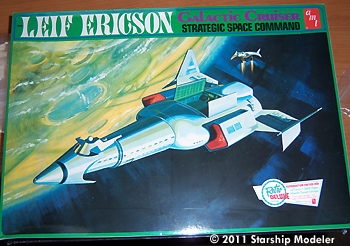 If you wanted to build an "accurate" Leif Erickson from the last version of the UFO Mystery Ship AMT released, you would have had to add a .060" spacer (roughly) where the neck was cut down, plus find (or make) replacements for the missing chrome and clear sprues. If you had Round 2's 2009 UFO kit, you would have still needed the spacer and the clear parts. The clear parts Round 2 have recreated (with help from Frank Henriquez) look to me dead on to the originals, and of course you now have all the chrome parts as in the original. Round 2 had the mold redone to make the hull one piece (no break in the neck) - but they did not lengthen it by the roughly .060", so the "new" kit is a tiny bit shorter than the original. It's not something I worry about - but your mileage may vary. One thing the the older kits had going for them was "build-ability". There are not a lot of parts and their layout is pretty simple, so putting the model together should not be overly tough (it wasn't for me when I built one in the mid-seventies as a 10 year old!). That said, you'll probably have plenty of opportunity to practice your PSR skills (Putty/Sand/Reapeat) - par for the course with these kind of kits. My experience with Round 2's decals has been that they are a bit on the thick side but settle down well with a nudge from a decal solvent like Micro-Sol or Solvaset. I've also found that if you don't cut into the clear carrier film that surrounds each marking, it will vanish into the background after you clear-coat the model (this is exactly the opposite of what I'm used to: normally, you cut as close to the marking as possible so you don't see any carrier film later). It's nice to see these old gems get some polish and a chance back on the shelves. Round 2 have done a credible job with the Leif and I look forward to seeing them start to pop up in the Reader's Gallery (and INSS MacArthur's, and Interplanetary UFO's�.). There are already some detail sets available, and more in the works, so the possibilities for this model look to be increasing. Look for a build review here in the near future! Highly recommended to all skill levels! To read the build up review, please click here. Many thanks to Round 2 for providing the review samples. Manufacturers and retailers, interested in getting your wares reviewed and publicized on a site averaging 6000+ readers a day? Contact us! 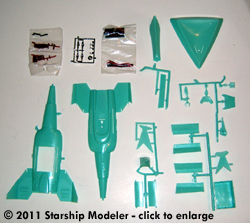 This page copyright © 2011 Starship Modeler. First posted on 16 September 2011.